The Spanish Inquisition conjures visions of witches, torture, and religious persecution. As an important seat of Spanish colonial power, Cartagena housed an office of the Inquisition. Today the Palacio de la Inquisición in Cartagena doubles as a museum of the Inquisition as well as the Cartagena Historical Museum. You can see some examples of torture devices and learn about the city’s history during a visit to Cartagena’s Inquisition Museum. Read on for a guide to the museum, including its historical significance, what you will see, how to get there, and visitor information. The entrance to the Inquisition Palace and Historical Museum in Cartagena. Cartagena, was a center of Spanish trade and military power during the colonial era. Therefore, it was a logical location for an office of the Inquisition, a tool to enforce the power of the Catholic Church and Spanish crown. The office was founded in Cartagena in 1610, the third site of the Inquisition in the Americas after those at Veracrúz, Mexico and Lima, Peru. It had jurisdiction over the colony of Nueva Granada, which included present day Panama, Ecuador, Bolivia, Colombia, and Venezuela. The Inquisition in the Americas tended to be less brutal than in Spain itself, and that was particularly true in Cartagena. The city was an important international trading center, which gave it a cosmopolitan quality that tended to lead to more tolerance. However, during its 200 years in operation, the Inquisition in Cartagena did investigate close to 900 people. Of those, 56 were convicted and made to carry out acts of penance, 12 of those publicly, and 5 of whom were sentenced to death. The building where the museum is housed today was completed in 1770, and is itself an excellent and beautiful example of colonial architecture. Upstairs houses the Cartagena Historical Museum with exhibits on the history of the city. Downstairs houses the Inquisition Museum with exhibits on the Inquisition along with examples of torture devices. There are also art exhibits and occasional temporary exhibits. The building also houses the city’s historic archives. 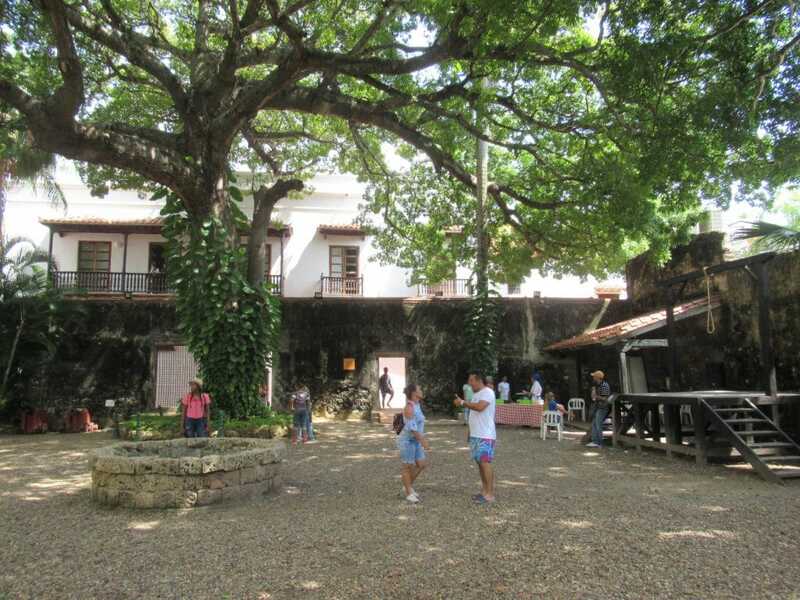 The inside courtyard of the Palacio de Inquisición, showing off its beautiful colonial architecture. Head up to the third floor to see the exhibits on Cartagena’s history. The first room is devoted to precolonial times and the Spanish conquest. There you can learn about the indigenous peoples who inhabited the area before the arrival of the Spanish, including about the village of Kalamarí, which stood where the historic walled city stands today. Continuing to the second room, you will learn about Cartagena’s role as an important and wealthy trading center during the colonial period. There’s a neat floor map that shows the transatlantic trade and puts into perspective Cartagena’s strategic location. There are also exhibits on the legacy of the slave trade in the city (Cartagena was the only designated slave port in Spanish held South America) and on the pirate attacks on the city. Next, you will learn about the history of Cartagena’s independence. Cartagena played a leading role in the independence of Colombia. The city declared itself a sovereign state on November 11, 1811, becoming the first place in present day Colombia to successfully establish a fully independent state. 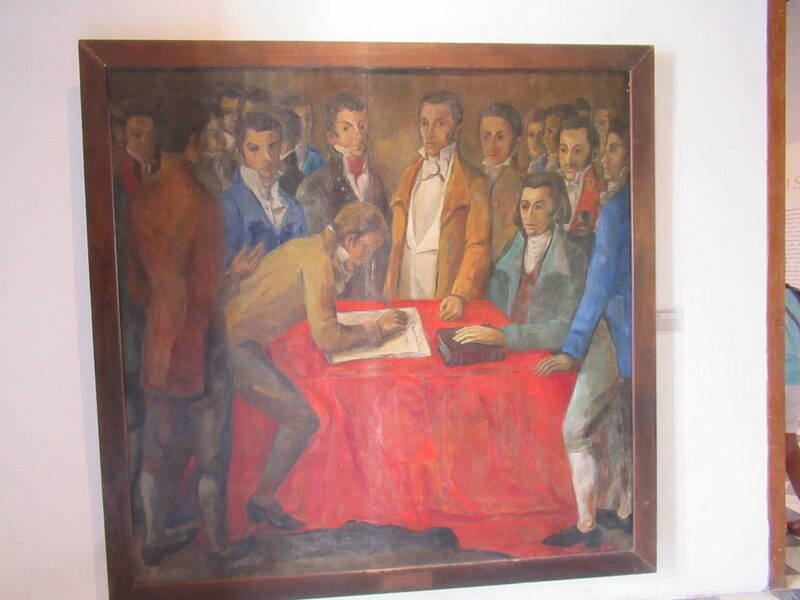 A painting showing the signing of Cartagena’s Declaration of Independence on display at the Cartagena Inquisition Museum. 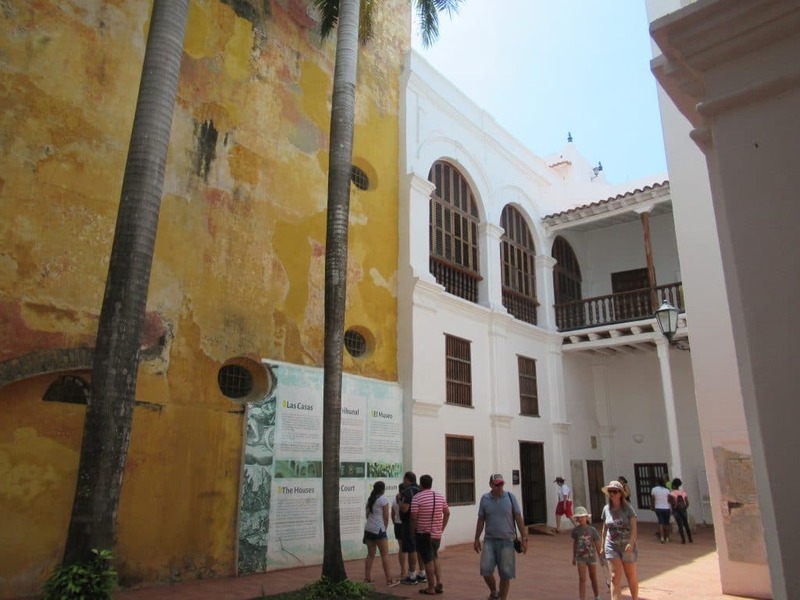 The final historical exhibit room details Cartagena’s decline in the 1800s as it suffered from the effects of the war for independence, outbreaks of disease, and being supplanted by Barranquilla as the major trading port. Gabriel Garcia Marquez’s Love in the Time of Cholera is loosely based on Cartagena in this era. Downstairs, there are several exhibit rooms on the Inquisition. There you will learn about its founding and its importance in maintaining the hegemony of the Catholic Church and Spanish Crown. There are also a few torture devices on display, and an explanation of how the process would play out from accusal to conviction. Additionally, there is a small exhibit on some of syncretism of European, African, and Indigenous cultures and its impact on Cartagena. Be sure you go outside to the patio, where there is a model of a guillotine (which actually was not ever used in Cartagena). Finally, you can see a model of a gallows and even take a picture with the noose around your neck and see some examples of colonial era cannons on display in the courtyard. The outside courtyard, notice the gallows to the right. 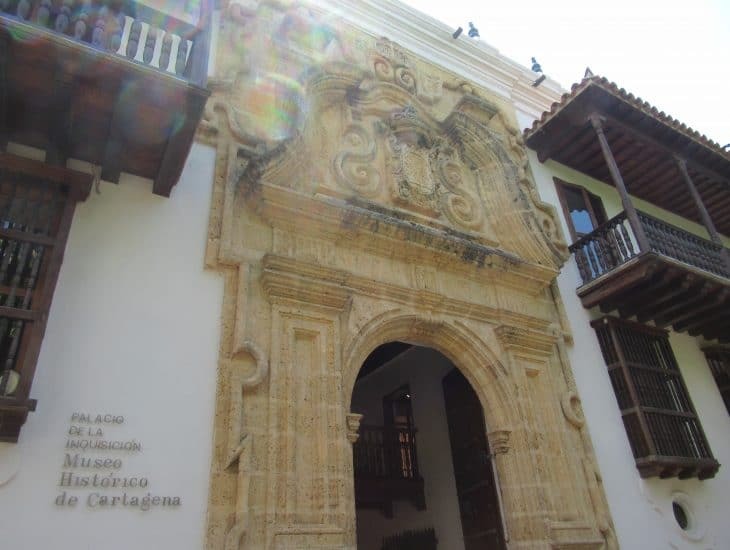 The Inquisition and Historical Museum in Cartagena is located centrally in the walled city. The Palacio de la Inquisici´on is on Plaza Bolivar across from the Museo del Oro, the Gold Museum. It is about a 5 minute walk from the Clocktower. Cost of Admission: Entrance to the museum is 20,000 pesos for adults and 17,000 for children, students, and seniors. Children under 5 enter free. *Note the last Sunday of every month is free for all visitors. There are audio tours and handsets that can be rented for an additional fee. Hours of Operation: Monday through Saturday the museum is open 9-6 and on Sundays it is open 10-4. Time to Visit: Expect to spend between 1 and 2 hours here depending on if you read all the exhibits. 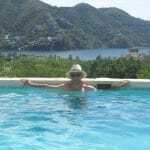 Planning your visit to Cartagena? Check out available properties and deals below. Interested in learning more about the Inquisition Museum and Cartagena’s history? Check out the museum’s website for more information on hours and any special events or exhibits. Check out our Primer on the History of Cartagena, or for a longer, more detailed read, check out our Comprehensive History of Cartagena. Check out this guide to plan a visit to Cartagena’s excellent Naval Museum, where you can learn more about the city’s history, including the numerous pirate attacks during the colonial era. Check out our visitor’s guide to the impressive Castillo San Felipe, a must see during a visit to Cartagena. Check out this guide to plan a visit to Cartagena’s Gold Museum, where you can learn more about the history of Cartagena’s and Colombia’s indigenous peoples as well as see some neat examples of their gold work. Check out the following books: The Fortifications of Cartagena de Indias: Strategy & History covering the city’s colonial military history (available in English and Spanish on Amazon) and Breve Historia de Cartagena (only available in English on Amazon). They can also both be picked up at local book stores. This entry was posted in Things to Do and tagged Museums. Bookmark the permalink.